Cat lady? You mean “winner!” Illustrated with colorful paintings of pretty kitties boasting names like “Aaron Purr,” “Colonel Snuggle Bottoms,” “Eartha Kitten,” and “Major Tom Cat,” this fun take on the classic card game comes with a twist. 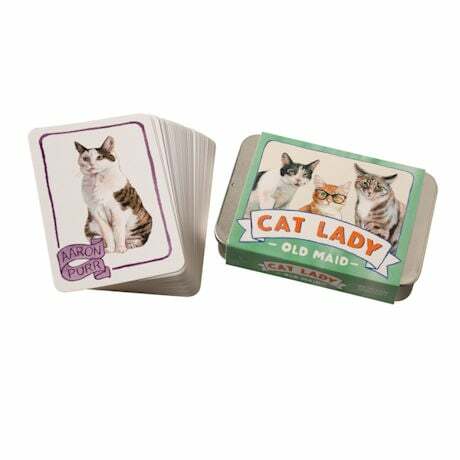 Yes, each player strives to match and discard pairs of cards…but the only way to win is to be the player left holding the Cat Lady card! Packaged cheekily in a cute little “sardine” tin. For all ages.